Update: Huawei has now launched the Honor 8 and you may find it a better alternative to the Honor 7. It's just out for the US so far at $399.99, but it comes with an upgraded processor, 4GB of RAM and a USB-C port. Huawei is one of the few Chinese handset makers to enjoy a rise in popularity outside its home country. Being linked to Google after collaborating on the Nexus 6P certainly hasn't hurt, and the launch of the Honor 7 was Huawei going all out to crack the west. To make its occidental ambitions clear, it's now easier than ever to pick up a Huawei smartphone, with Huawei's Vmall online store finally launching in the UK and Europe, enabling you to buy Huawei's handsets directly from the manufacturer. Can it make it big in the West? Huawei could also be looking at making it easier to walk into a high street store and buy one of its devices, or get one with a contract. At the moment Honor handsets are sold exclusively in Three UK network stores, and are tied to that carrier. Making its phones more readily available and easier to buy will certainly help Huawei's standing in the West, and to get people even more tempted by its latest handset it's offering a limited deal that knocks €50 (around £36, US$56, AU$78) off the asking price if you join the 'Honor Club'. Even when the offer ends, the Honor 7 will still offer excellent value for money, joining its compatriots the One Plus 2 and the Meizu M2 Note in offering impressive hardware for low prices, with a price tag starting at £249.99 (around US$393, AU$547). Considering that the Honor 7 comes with an octa-core processor, a choice between 16GB and 64GB of storage and 3GB of RAM, that's not a bad price, with a fingerprint scanner and 20-megapixel camera sweetening the deal even further. This isn't a budget phone with all but the most basic features cut out, but a decent handset for a compelling price with a few neat features and innovations thrown in as well. From a western standpoint, the Honor 7's biggest competition is from the recently released Moto G (2015), which comes in two flavours: the 1GB RAM and 8GB storage version for £179 (US$179, AU$250), or the 2GB RAM/16GB storage version for £209 (US$219). So does the Honor 7 continue the winning streak of Chinese handsets by offering a great experience for a lot less money? Read on to find out. At first glance the design of the Huawei Honor 7 is rather straightforward and basic, and more than a little familiar. It reminded me of a cross between the Apple iPhone 4 and the Xperia Z3+, which means that while it's far from an ugly handset, it doesn't exactly wow either. 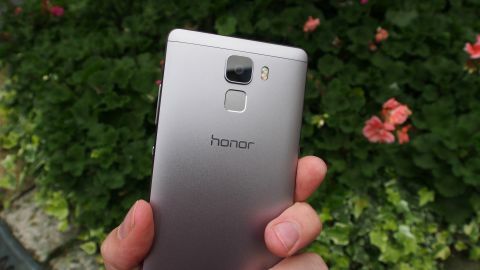 Does the Huawei Honor 7 look familiar to you? With smartphones becoming increasingly competent on the inside, we're often looking for devices that offer something a bit different on the outside, and while I wasn't expecting any premium, paradigm-shifting innovations like the Samsung Galaxy S6 Edge's curved screen, it would've been nice to be confronted with a design that didn't make me think "I've seen this before". However, while the front of the Honor 7 seems derivative of Apple's and Sony's offerings, the back is quite different, with a slightly curved brushed aluminium back which feels nice to hold, as well as giving the handset a sturdy feel. I wouldn't worry about dropping this phone as much as one with a glass front and back. The back of the Honor 7 is also home to the rear camera and LED flash, and just below that a fingerprint scanner. Its location towards the centre of the back makes it more comfortable to reach when you're holding it in your hand than fingerprint scanners on the front of the body, although this also means it's easier to accidentally touch. Back to the front of the device, where the 5.2-inch 1080p screen is surrounded by two thin bezels on either side that keep the Honor 7 thin enough to hold comfortably, with dimensions of 143.2 x 71.9 x 8.5mm and a weight of 157g. The bezels above and below the screen are quite a bit thicker, however. While I'm willing to forgive Huawei for the thick top bezel, as it holds the front-facing camera, LED flash and speaker for phone calls, the bottom bezel seems like wasted space. This is because there are no buttons, speakers or even logos here. Sure, the extra room is probably taken up with hardware underneath the body, but it makes the Honor 7 look a little plain. It also means that the speakers for ring tones and media are relegated to the bottom of the body, so they can often be covered by an errant palm, making the sounds coming out of them seem muffled; it's a shame that the empty space of the lower bezel wasn't used for front-facing speakers. On the right-hand side of the handset are the volume rocker and power button, which are again in easy reach if you're using the Honor 7 one-handed. There's a single button on the left-hand side of the body, and at first I thought this was a dedicated camera button – but on pushing it, nothing happened. However, holding it down opened up Google Now, which I'm not too sure I like. On other handsets with stock Android I was happy enough to swipe left to get to Google Now when I needed it, and I never felt that I was missing a physical button to bring it up. I also accidentally pressed it on a couple of occasions, which was pretty annoying. Some Google Now addicts might love this addition, but I feel that it's a waste of a button. The volume rocker, meanwhile, acts as a physical camera shutter button when the Camera app is open. Finally, the micro USB port resides at the bottom of the chassis – there's no USB Type-C here – with a headphone jack at the top. Overall, the design of the Huawei Honor 7 is solid if uninspiring. It's certainly not an ugly phone, but it does little to stand out from the crowd either – which could be a problem if Huawei is planning on making a splash with this device and bringing it to the high street. With more opportunities for potential customers to take a look at the device and hold it in their hands, Huawei could have pushed a bit harder for a design that really leaves an impression, so although the design isn't bad, I still feel it's something of a missed opportunity.